The AZ91D magnesium alloy was chosen as experimental material, whose chemical composition was shown in Table 1. The test plates were cut into 10 m×10 mm coupons and polished to 1.5μm mirror finish. The surface was first ground with No.1000 SiC paper, followed by No.1500, No.2000, and finally 1.5μm diamond suspension in oil. The polished specimens were degreased by sonicating in acetone for 10 min, and then methanol for 10 min with a final distilled water rinse. Acid activation was performed by immersing the polished, degreased samples in an aqueous solution of 125 g/L CrO3 and 110 mL/L HNO3 at room temperature for 30s. This step was followed by rinsing in distilled water. Following acid activation, the samples were immediately immersed into the AgNO3 solution with different concentrations (from 0.01 to 0.05 M) for a certain time (from 5 s to 2 min) at room temperature (about 298 K). This step was followed by rinsing with a large amount of distilled water (50 mL) for three times. After being rinsed in distilled water, the samples were immersed in the electroless solution for plating Ni-P deposition layer. The electroless solution was taken in a 1000 mL glass beaker which was kept at constant temperature by a thermostat. The bath composition and all operation parameters for electroless Ni-P deposition are listed in Table 2. The surface morphologies of the obtained samples were observed by the scanning electron microscope (JSM- 5500LV, Japan Electronic). Static water contact angles of the prepared surfaces were estimated with a contact angle meter (JC2000A Powereach, China). 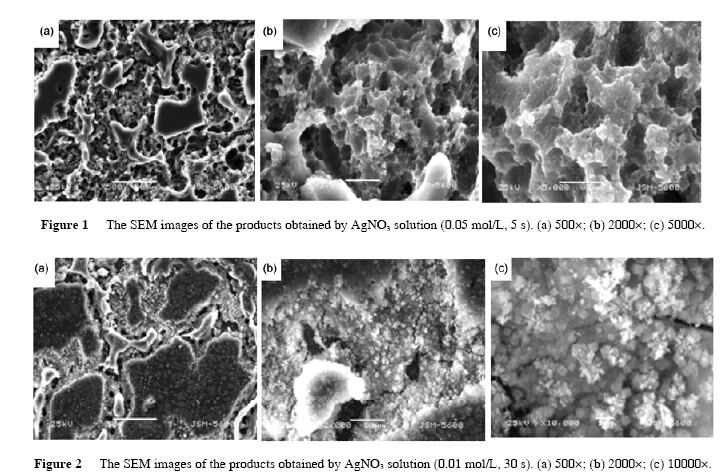 The typical SEM images of the products obtained with different concentrations of AgNO3 solution and different reaction times are shown in Figures 1 and 2. The different microstructures were formed due to variety of experiment conditions. As seen in Figure 1(c), under a higher magnification SEM images, the porous structures were clearly shown when concentration of AgNO3 was 0.05 mol/L and reaction time was 5s. However, Figure 2(c) showed some little dendritic structures when concentration of AgNO3 was 0.01 mol/L and reaction time was 30 s. It is well known the magnesium alloy is an active metal and the speed of reaction is very high when it is immersed into AgNO3 solution. When the AgNO3 solution was 0.05 mol/L, the speed of reaction was too fast for the silver on the magnesium alloy to grow, so only the porous structure was formed after the magnesium alloy was corroded. When the AgNO3 solution was 0.01 mol/L, the reaction time became slow, allowing a preferential growth of dentrites on the magnesium alloy substrate, which were formed after Ag deposition. These results indicate that the concentration of AgNO3 solution and the reaction time play an important role in the formation of microstructure on the magnesium alloy substrate. 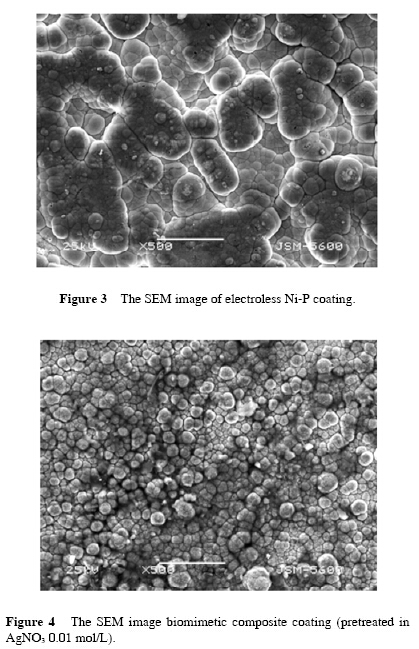 Figure 3 showed the morphology of the electroless Ni-P coating. In the coating deposition process, nickel polycrystalline modules of predeposition formed the microscopic nodular and resulted in “edge effect” so that the current density increased and deposition rate accelerated. Thus, the role of feedback loop exerted, ultimately cellular organization of “cauliflower head” was formed on the surface coatings. Figure 4 showed the morphology of the biomimetic composite coating. The little dendritic structures make magnesium alloy substrate rough and enhance coalescentforce between magnesium alloy and Ni so that the biomimetic coatings become fine and compact. Figure 5 showed the contact angles of different coatings. Surface wetting properties relies on the surface structure particles. It ws found that when the microscale bumps were used to form coating, the surface exhibited highly hydrophilic properties with a contact angle (CA) close to 108°(Figure 5(c)), which was obviously different from that of the untreated one (53°) (Figure 5(a)). Based on the morphology shown in Figure 5(c), it was believed that the structures of microscale bumps created more vacancies among individual nanostructures to trap air . The coating was finer and more compact when the samples were pretreated in the 0.01 mol/L AgNO3 solution than in the 0.05 mol/L AgNO3 solution. Therefore, the contact angle of coating (pretreated in 0.05 mol/L AgNO3 solution) was only 87°. To understand the origin of the observed high hydrophobicity, we have described the CA in terms of the Cassie–Baxter equation , cos θr = f1cosθ0 − f2, where f1 and f2 are the fractions of solid surface and air contacting with liquid, respectively, θr and θ0 are the CAs on the bionic surface (108°) and on the Ni-P coating surface (53°), respectively. Since f1+f2=1, f1 is calculated to be 0.41. The low value of f1 suggests that the microscale bumps are responsible for the high hydrophobicity. In another word, this result indicates that the obtained microstructures can be used as highly hydrophobic and bionic surfaces.
. The biomimetic composite coatings were fabricated by wet-chemical method combining electroless on AZ91D magnesium alloy surface.
. The crystallization of biomimetic nanocompostie coatings were more uniform and the microstructure was denser than Ni-P electroless coatings (untreated).
. The contact angles of the biomimetic composite coatings were measured and the maximum reached 108°, which is hydrophobic. The main reason for hydrophobicity is the microstructure of surface and the CA.